This step usually doesn't happen too often as most company payroll area setup are fairly simple. They have one unified frequency of pay and not too much variation of it. However, there are companies who tends to be complex. Creating a payroll area to match up for each company code they have. So whenever a new company is onboard, a new payroll area occur, this is when this help become useful. To setup a new payroll area is fairly simple. Guide yourself in the SPRO / IMG to Personnel Management -> Personnel Administration -> Organizational Data -> Create Payroll Area. 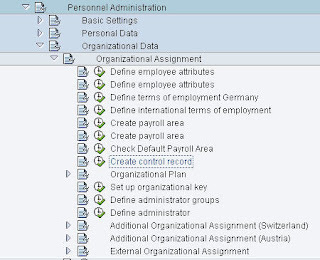 You'll might be thinking, why are there two "Create Payroll Area"? If you have been using SAP long enough you will tend to notice this is a common thing. As to why, no freaken idea. The first one of the two is where you will be creating the actual Payroll Area, you want to start there first. As normal with any SAP tables, you have a two character short key and a description. If you do SAP Payroll, this is where you would flag if this is used for payroll processing. Otherwise, leave it blank. In the next Create Payroll Area node, this is where you will link the period parameter and date modifier. Assumping the date modifier and period parameter hasn't changed. If they did, you would need to configure that as well. To default the payroll area in infotype 0001, you can "Check Default Payroll Area" in that node. Depending on how your company organize the defaulting, you can follow the feature tree and to setup the default. The next step is to create the payroll control record for it, if you been maintaining it in the past you would know it is transaction PA03. That is basically it when you want to utilize a new payroll area. The reason we see two "Create Payroll Area" nodes is that they are for different countries. If you go to menu item "Additional Information" -> "Country Assignment" then you will see an additional column which will tell you the country for the node. One of them is for Austria, Switzerland, Germany and Spain. Second one is for all other countries including USA.